LUCZ — Concealed-flange hanger available for 2x6, 2x8, 2x10 and 2x12 lumber. Ideal for end of ledger/header or post conditions, the LUCZ also provides cleaner lines for exposed conditions such as overhead decks. LU — Value engineered for strength and economy. Precision-formed — engineered for installation ease and design value. U — The standard U hanger provides flexibility of joist to header installation. Versatile fastener selection with tested allowable loads. HU/HUC — Most models have triangle and round holes. To achieve maximum loads, fill both round and triangle holes with common nails. These heavy-duty connectors are designed for schools and other structures requiring additional strength, longevity and safety factors. Galvanized. Some products available in ZMAX® coating. HU/HUC — Can be installed filling round holes only, or filling round and triangle holes for maximum values. Joists sloped up to 1/4:12 achieve table loads. For installations to masonry or concrete, see HU/HUC/HSUR/L. HU/HUC hangers can be welded to a steel member. Allowable loads are the lesser of the values in the hanger tables or the weld capacity — refer to technical bulletin HU/HUC Welded onto Steel Members (T-HUHUC-W). When nailing into carrying member's end grain, the allowable load is adjusted by a factor of 0.67. For both flanges concealed, order HUC. 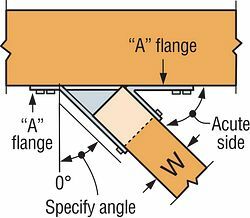 When the HUC is skewed, the header flange opposite the skew direction is not concealed. See image gallery. The HU is available with the A flanges straight at table loads listed. For low-cost, code approved 45° skewed hangers, see SUR/SUL. For field-adjustable hangers, see LSSJ, LRUZ and LSSR. See table-modifications table for available options and associated load capacities for U and HU hangers. For ease of ordering, refer to technical bulletin U/HU Hanger Special Order Worksheet (T-U-HU-WS). Model configurations may differ from those shown. Some HU models do not have triangle holes. Contact Simpson Strong-Tie. Modified seat is sloped, skewed, or both. If sloped only or skewed only, use a smooth-shank stainless-steel reduction of 0.65. For hanger applications with both flanges concealed, W must be at least 2 5/16". To order, ask for HUCXXX. For skewed HUC, only flange on acute side is concealed. 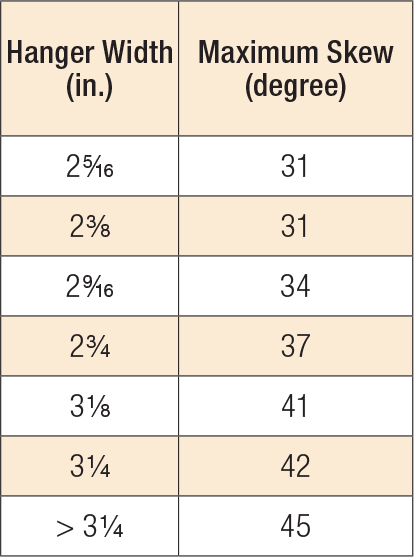 Skews over 50° require a square-cut joist. HU28-4 No evaluation report listing. HU88 No evaluation report listing. HUC210-4 No evaluation report listing. HUC26-3 No evaluation report listing. HUC28-4 No evaluation report listing. HUC810 No evaluation report listing. HUC812 No evaluation report listing. HUC814 No evaluation report listing. HUC816 No evaluation report listing. HUC88 No evaluation report listing. LU See specific model numbers for code listings.